Happy New Year, all! Hope everyone had a warm, festive Eve and is relatively headache-free and rested post-revelry. 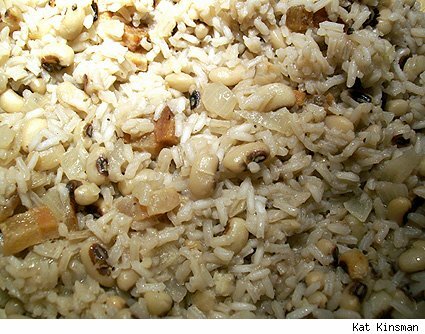 Now, there are as many ways to prepare the cowpea and rice concoction of Hoppin’ John as there are squares on a calendar, but in many parts of the American South, the definitive date to simmer up a big ol’ pot of it is New Year’s Day. While the name’s origin is still the subject of some debate — some scholars asserting that it’s a corruption of “pois a pigeon,” a Carribean dish enjoyed by Southern slaves while still in their native land, and others claiming it’s derived from a 13th century Iraqi dish called “bhat kachang” — the dish’s fans maintain that eating it ensures good luck for the coming year. This may well be superstition, but I’m inclined toward any angle that’s gonna get a bowlful of it in front of me on a chilly January 1st. My grand revelation of the day (though likely hardly news to many of you) is that cowpeas are the genus for the group that contains blackeye peas (most commonly used in Hoppin’ John), catjang, and yardlong beans. They’re also called crowder peas. Some recipes for Hoppin’ John contain tomatoes or okra, and the swap in of okra for the beans makes it a Limpin’ Susie. Got a favorite variation? Share it below, and peruse my favorite recipe after the jump. This entry was posted in Recipes, Slashfood Archives on January 1, 2009 by Kat Kinsman.